Chelsea have admitted a Football Association charge of failing to control their players in last month's league game aginst Manchester United. The charge relates to the conduct of the players towards referee Mike Dean after he sent off Mikel Jon Obi. Assistant coach Steve Clarke has also admitted using abusive and/or insulting words towards the match officials at the end of the defeat at Old Trafford. The club and Clarke have asked for personal hearings on the matter. Chelsea were incensed by Obi's dismissal in the first half for a challenge on Patrice Evra and contested it, but the FA rejected their appeal and his three-match ban was upheld. England captain John Terry escaped punishment after appearing to grab Dean's red card. 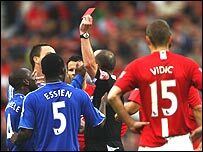 Chelsea were fined £10,000 in April 2006 for the same charge of failing to control players after referee Mark Halsey was surrounded during a match against West Brom. They were given a further £10,000 fine and warned as to their future conduct after again being found guilty of failing to control their players during a 1-0 Premiership defeat at Fulham, a charge which the club had denied. Last season Chelsea were handed a £100,000 fine and reprimanded for their part in a brawl with Arsenal players during the Carling Cup final.